This quick and easy recipe for shrimp and sausage scramble can be customized to be as spicy as you like by using different kinds of sausage. A perfect brunch or light supper! This quick and easy recipe for shrimp and sausage scramble is not only one of my go-to suppers at the end of a long hard day, it’s also easy to customize by varying the type of sausage you use. If you are a spicy type of person like the Southern husband, go for andouille sausage or chorizo. If you are a spice wimp like myself, kielbasa or chicken sausage is what you want. 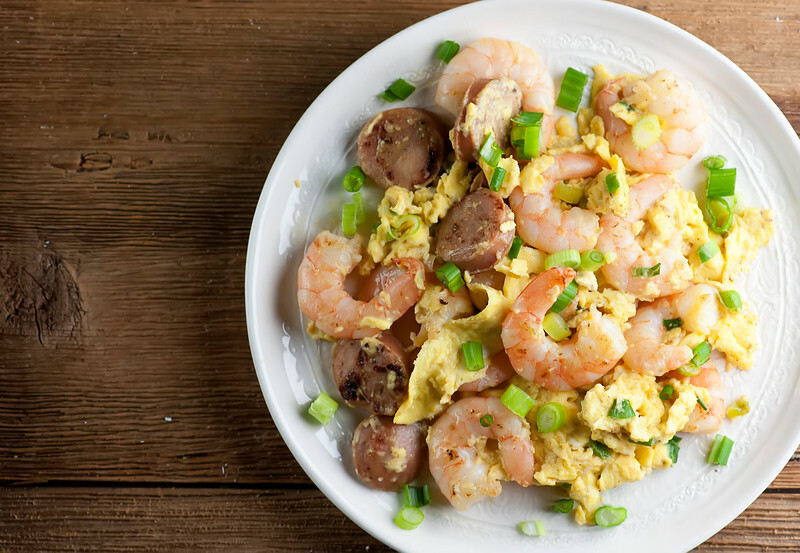 Either way, the conglomeration of sausage and shrimp scrambled up with eggs might not be the prettiest plate full of deliciousness, but it is definitely all kinds of scrumptious…and both fast and healthy at that! Ready to scramble? Let’s make it! This recipe came about during one of our rounds of the Whole 30, because during those times we always keep the one compliant sausage we have been able to find in the fridge at all times, and that is Aidell’s chicken and apple sausage. It is delicious and doesn’t have a speck of sugar in it, so it works perfectly for this dish. You start by cutting the sausage into bite-sized rounds and browning them up in a skillet. I always like to serve anything with eggs on warmed plates, just to keep them the right amount of warm as you eat them. I have a warming drawer in my kitchen, but you can also pop your plates in the oven at 200 degrees about a half hour before suppertime and they will be nice and warm. 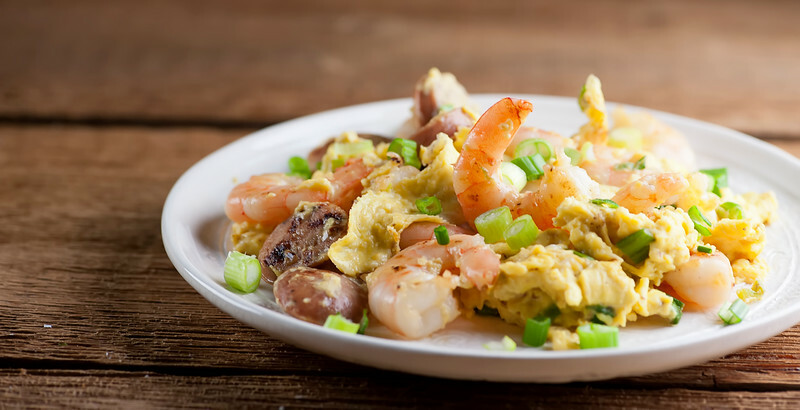 So the next time you have a scrambling type of day, try this shrimp and sausage scramble for supper. In your pajamas. Feel much more relaxed. Heat olive oil in skillet over medium heat and saute sausage for 1-2 minutes. Add shrimp and half the scallions and stir until shrimp are just cooked through, about 2-3 minutes. Add eggs and cook, stirring continuously until they are set. Salt and pepper to taste and serve immediately, topped with the rest of the scallions. You can use any type of pre-cooked sausage for this recipe. For a spicier dish, try andouille or chorizo sausage. For a milder taste, use chicken sausage or kielbasa. I love your shrimp recipes, always so easy and delicious! I have never mixed shrimps with sausage or eggs, sounds like something I would love for lunch today.